TF Solaris - stylish template to create a portfolio of sites with full support for adaptive design. Modern and original design template that uses all the possibilities of new technologies CSS3 and HTML5, is perfect for creating websites with visual presentation materials. Convenient control panel basic template settings will configure the appearance of the site as required. Among the main features of the pattern stands out: a good code optimization, faster page loads and support all browsers. 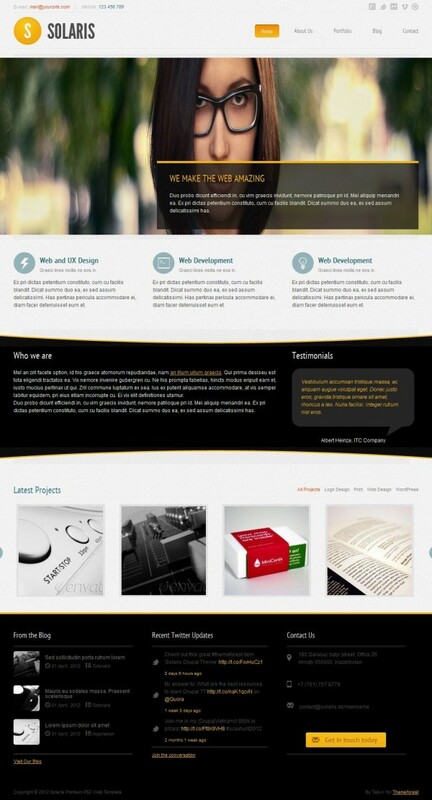 To increase the functionality of the template created a popular component K2. In the assembly includes a number of third-party extensions: DJ-ImageSlider, Gnome Tweets, IceCarousel and Tabs & Sliders, can enhance and beautify any site.